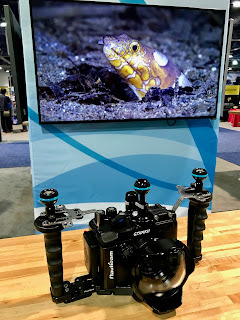 These are some new underwater photo products and some of my good industry friends from the 2016 DEMA dive show. Many of the products featured are prototypes and will be shipping in 2017. 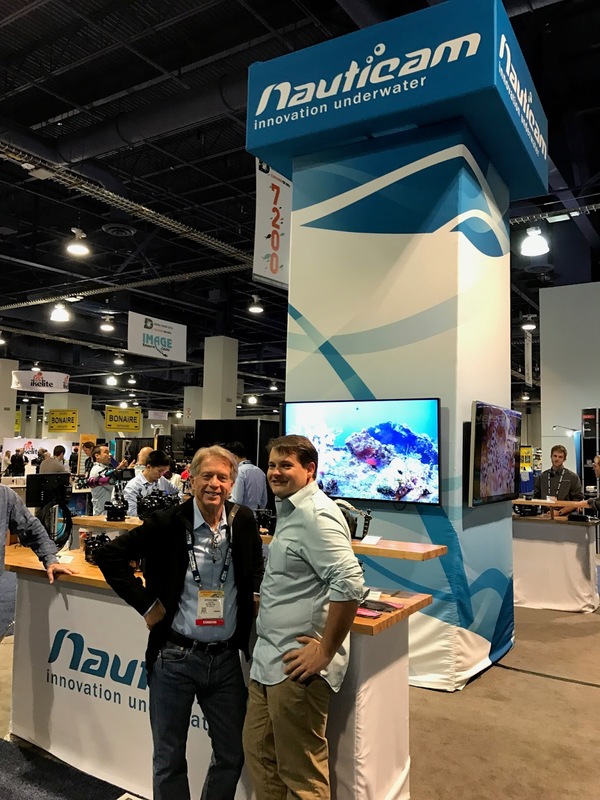 Look to Optical Ocean Sales​ to always have the latest underwater imaging products! 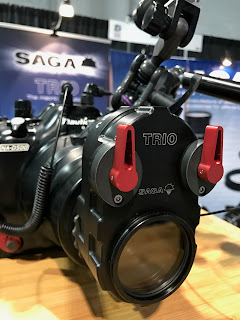 Probably one of the most innovative products is the new Saga Dive​ Trio macro lens. 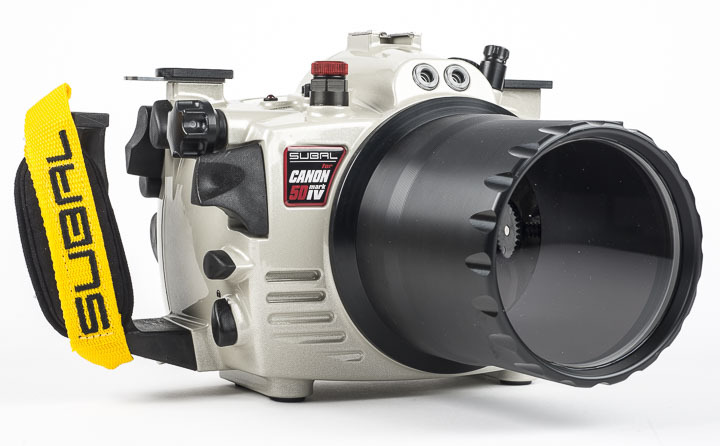 It allows you to use the basic lens, then flip levers to +5, +10 or +15 powers - all in one unit! We will have a pre-production unit in the store in a couple of weeks. Shipping in early January, cost around $775. 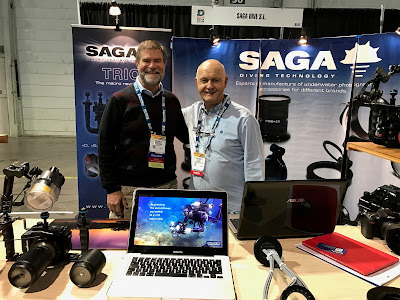 Myself and José Sánchez Garrido from Saga Dive​ from Spain. Stephen Frink​ and I are your North American SEACAM​ dealers. SEACAM is the premium pro choice for underwater imaging. We now are offering their new 5DMKIV and Nikon D500 housings. A new strobe is in the works to ship in December. 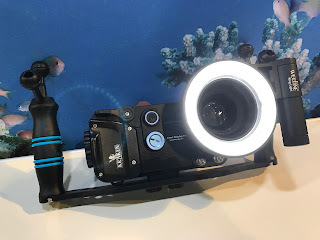 Besides their new light line-up (reviewed here and amazine Solar Flare Max) Kraken Sports​ has a new LED ring light unit coming soon. It will have a 67mm threaded mount, 1000 lumen power and integrated battery. It can work with almost any housing with port adapters. I think it will be perfect for a small macro setup. 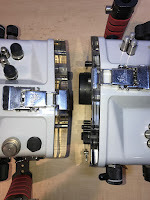 They are also starting to ship a new underwater universal phone housing. This rugged housing is made from anodized aluminum, has a vacuum leak detection valve included and uses bluetooth to connect with an app to nearly all phones made, except ones made with a really thick case. some of the new Nauticam USA​ products. 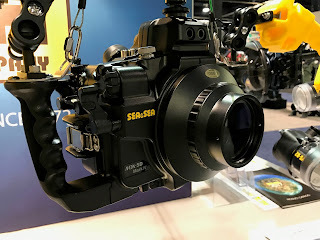 New Nauticam NA-6500 for the new Sony a6500 housing (at right) will soon be in stock at Optical Ocean Sales. 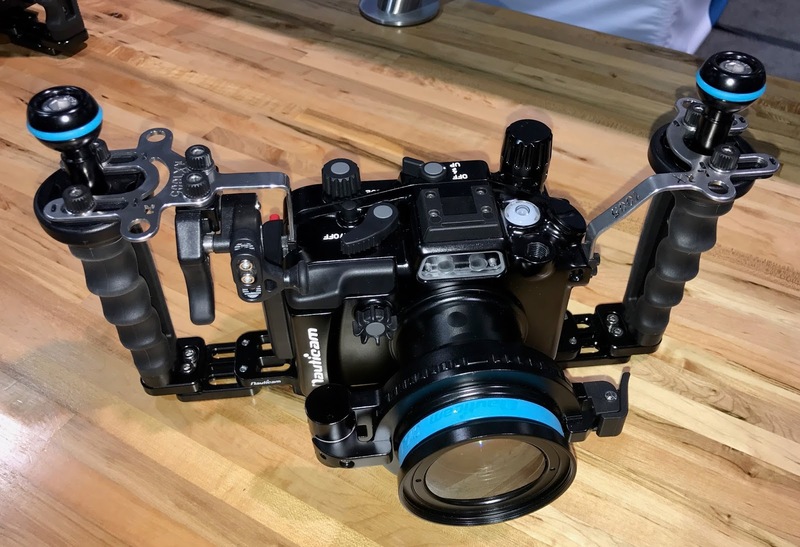 This new housing for the update to the a6300 now includes an integrated tray. With lots of port options available and the unique WWL lens, this is a less expensive contender to the Sony a7II. This display shows of the port solution for using the Tokina 10-17 lens for those wanting to move from a Canon DX DSLR. 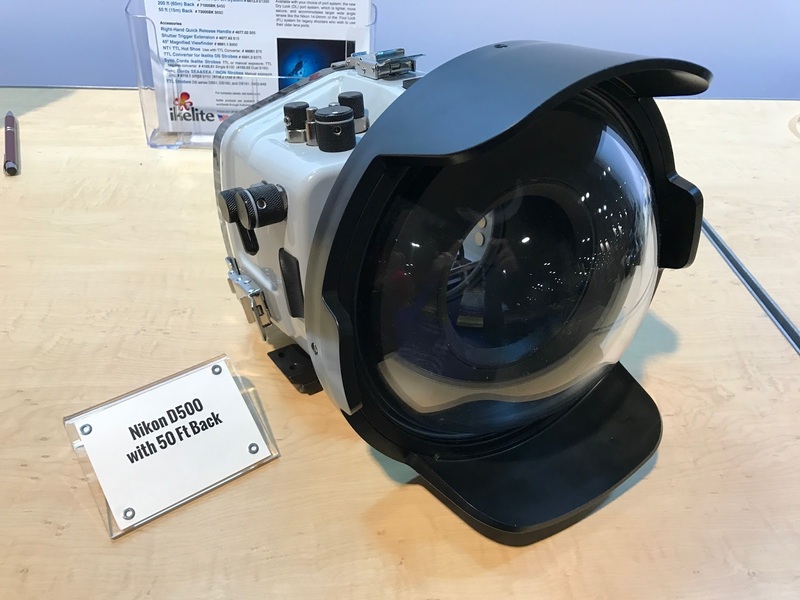 Also new is the Nauticam RX-100V (right). The new Sony RX-100V will fit a modified RX-100IV, but will require an upgrade. Nauticam G7XMKII housing (left). This is a great consumer gamer with a 1” sensor and easy-to-use menus. AF speed, battery capacity and other features have been addressed in this new MKII version. 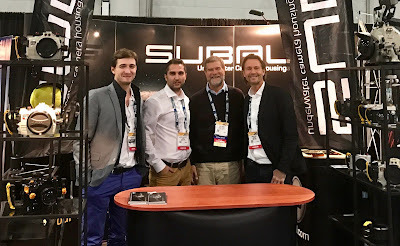 My good friends at SUBAL Underwater Camera Housings​ have many new camera housings with greatly improved features coming out. Beside Nikon and Canon they also support pro cameras like Leica and consumer cameras from Panasonic. New features include easy to open locks, a small fiber optical TTL trigger for Canon and Nikon, vacuum check system and improved, lighter weight and balance. 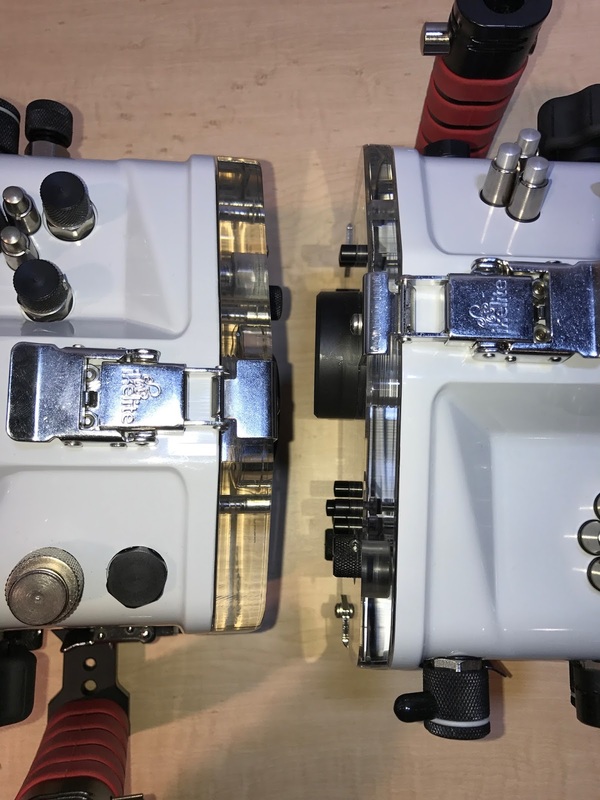 They have over 50 years of experience and produce some of the finest housings available. With the lower euro, their prices are very competitive! 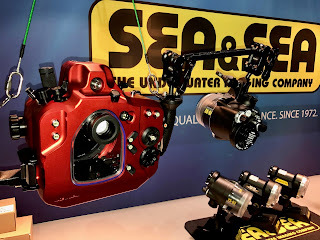 Optical Ocean Sales​ is very excited to be one of their stocking dealers! 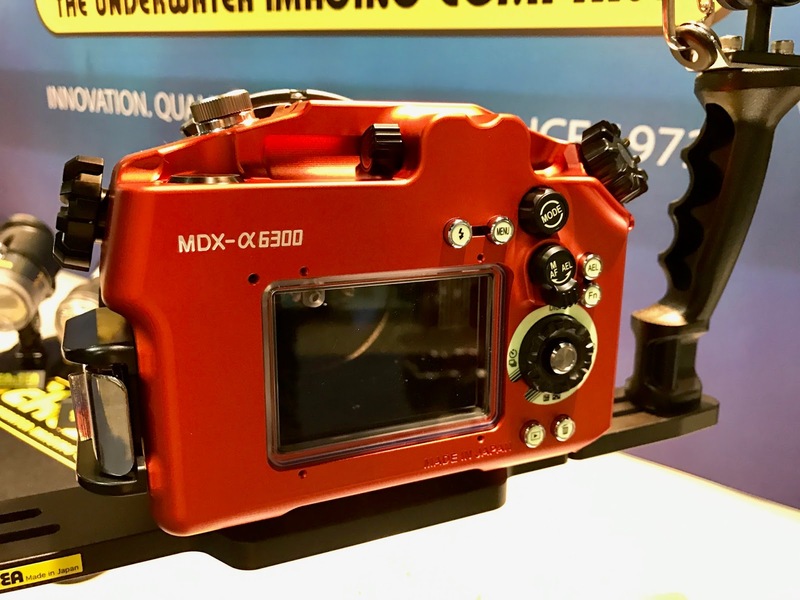 New SEA&SEA MDX-80D for the Canon 80D DSLR, now available in a bronze-red color. 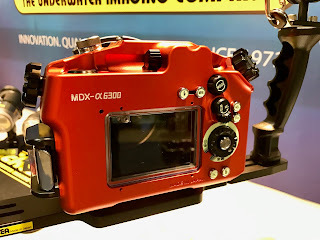 New SEA&SEA​ Sony MDX-a6300, also available in bronze color, similar to the a6000 with some updates, including glow-in-the dark controls and rinse weap holes around buttons, new knobs and more. 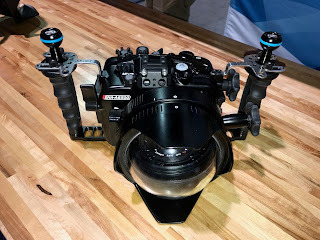 They will not be making an a6500 housing as far as they know. New SEA&SEA​ MDX-5DMKIV DSLR housing. 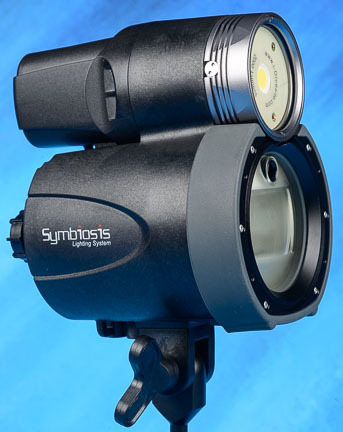 This is a small and capable 5DMKIV housings and has an optional TTL optical fiber optic converter. They will be coming out soon with a leak detection valve system. 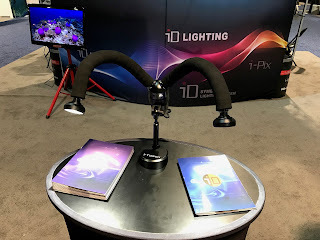 Besides the ground-breaking Symbiosis SS-2 strobe/light that i-DAS/i-Torch​ produces, they've come up with an unusual new LED macro lighting system with adjustable arms. There will be snoot adapters available for it. Each head produces 2000 lumens. This is a prototype, probably available mid-year. Light and Motion has reved some of their lights with the same pricing! This is the more powerful new Sola 9600 Video Pro and Sola 3800F video lights. We reviewed the Sola 8000 earlier this year and really liked them. 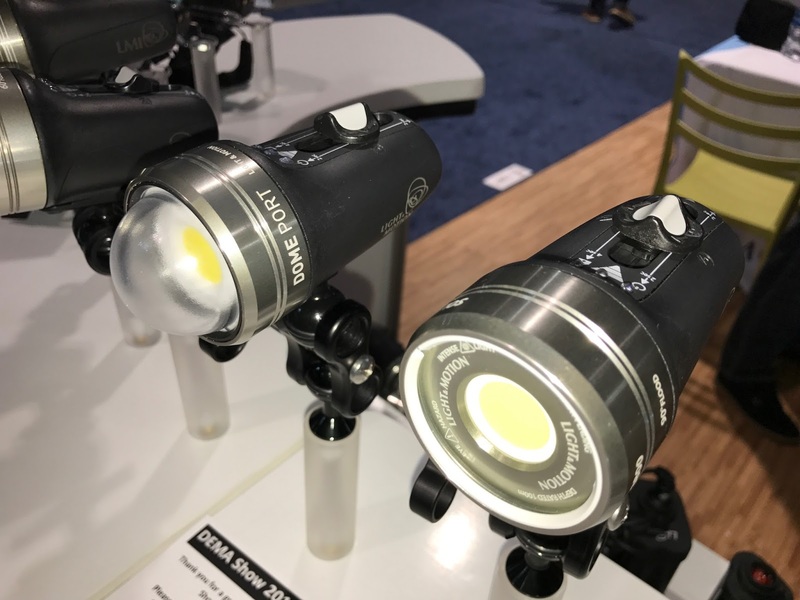 There is also a new dome port shown that can fit their smaller lights to spread the light to 105 degrees. 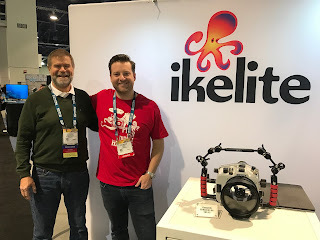 Myself and John Bingham from Ikelite Underwater Systems​. Ikelite has been hard at work revising and creating new housing products. Ikelite Underwater Systems​ new D500 housing with their redesigned port system. The dome port and housing is much lighter that it used to be. 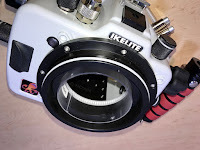 Ikelite Underwater Systems​ now has an improved port system that is more positively sealed and very secure. 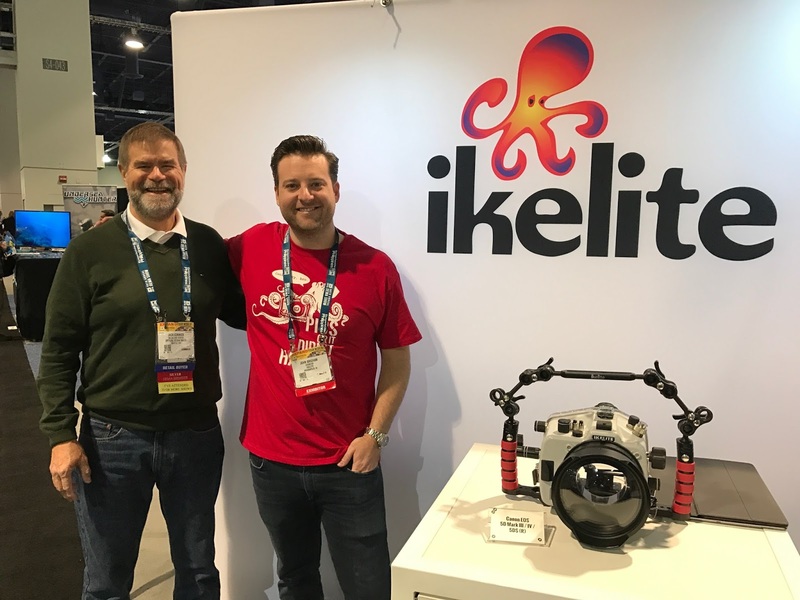 Ikelite Underwater Systems​ has a new mix and match lighter housing and back system. 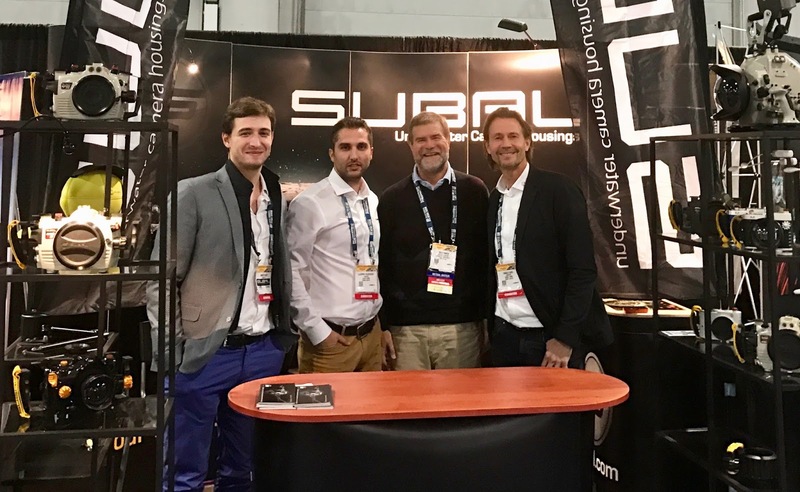 You can buy a surf housing that is light and easy to handle and upgrade it to a dive housing later. 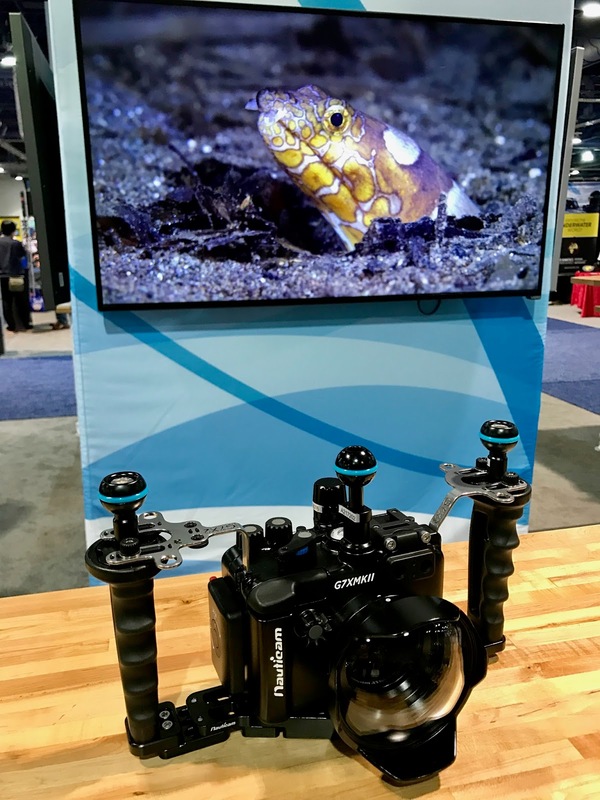 Ikelite Underwater Systems​ has also improved their knobs, and now have shutter release extensions and other options available. With these additions, you can create a custom fit and featured underwater housing system. 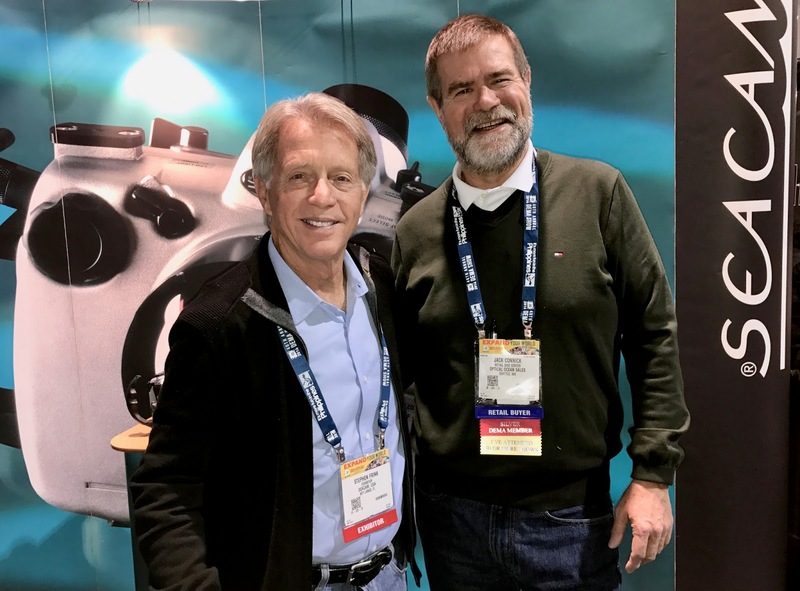 CineBags has created a new line of innovative and well thought-out underwater photo soft carrying cases, backpacks, port and tool cases and others. They are made from very heavy, durable materials and designed from their many years in making professional photography bags. At left is their new CB 70 Square Grouper. My pal Alberto Reija Gracia​ from DIVE Damai​. 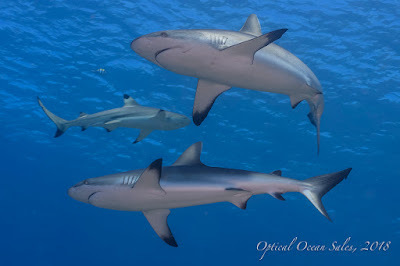 We have several upcoming trips on their luxurious liveaboards. We have room on all these great trips, see our Travel section. 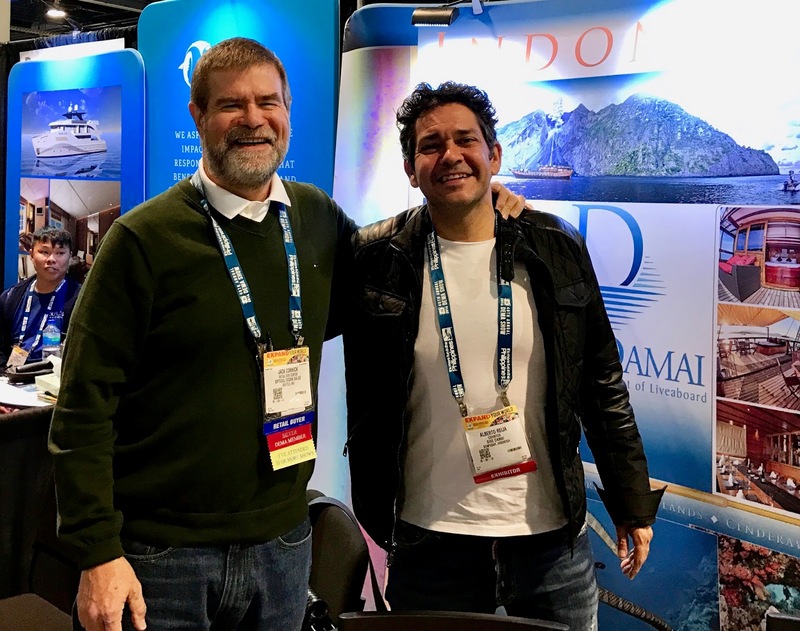 We just booked a new Banda Sea to Raja Ampat trip on the Damai 1 in April of 2019, details soon! Pam Mazey Mertz and John Ellerbrock from Gates Underwater Products. 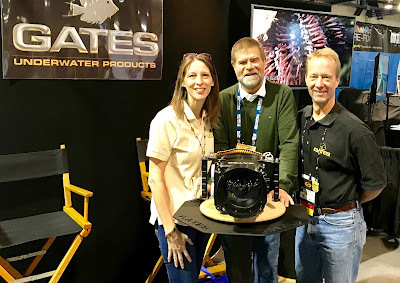 Gates​ has a new PRO Action housing. This housing is purpose built to be a compact, travelable, run and gun system, depth rated to 150 feet. It has a smaller set of controls – on/off, record, zoom, focus, user and assignables. It can be pole mounted and is good for surf and free diving. Best of all it can be carried on an airplane!